This location is a ten mile section of beach midway along the west coast of the Olympic Peninsula facing the Pacific Ocean. Ruby Beach is at the north end of this section. This area is part of the Olympic National Park and also the Quillayute Needles National Wildlife Refuge. The beaches along here are typical coastal beaches consisting mostly of gravel with sand exposed at low tide. There are also large outcroppings of rock jutting into the water at intervals along the beach. As with all ocean beaches, be aware of incoming tides which can trap you on the wrong side of these headlands. 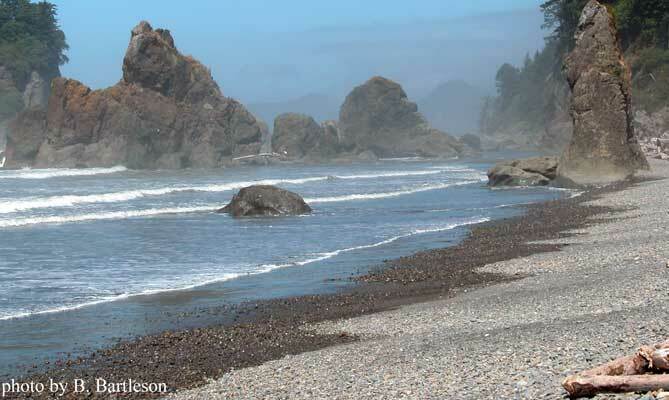 Ruby Beach is sand, gravel and many large rock outcroppings. Kalaloch is almost entirely sand with just a few sporadic boulders visible at low tide. This is only a sampling of data from Kalaloch and it will not be rated for frequency of occurrence.